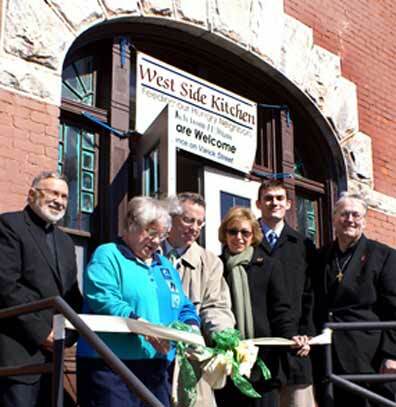 UTICA, Nov. 10, 2009 -- Mother Marianne's West Side Kitchen, which has served more than 37,000 meals since opening its doors in March 2008, is appealing for pies and volunteers for Thanksgiving. "We will be serving a full Thanksgiving dinner for over 100 people, and we could use pies for dessert and volunteers to help prep and serve," said soup kitchen supervisor Joanne Lockwood, SFO. "Pies may be dropped off the week of Thanksgiving between 9:30 a.m. and 1 p.m. Monday to Wednesday, and Thanksgiving morning on Thursday, Nov. 26." The soup kitchen serves lunch Monday through Saturday from 11:30 a.m. to 12:30 p.m. and is named after parish daughter Bl. Mother Marianne Cope, missionary to the lepers of Hawaii's Molokai. She noted that anyone "interested in volunteering or helping out may fill out the volunteer form or call volunteer coordinator Vicki Montalbano at 315-735-4429.